An unmanned aerial vehicle (UAV), commonly known as a drone and referred to as a Remotely Piloted Aircraft (RPA) by the International Civil Aviation Organization (ICAO), is an aircraft without a human pilot aboard. UAV's have opened up a whole new world of surveying, Ortho photo production, 3D modelling and feature extraction possibilities. 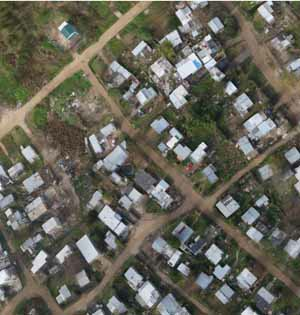 Due to the massive simplification of the data acquisition stage, compared with conventional methods of aerial capture, the costs involved have been drastically reduced. 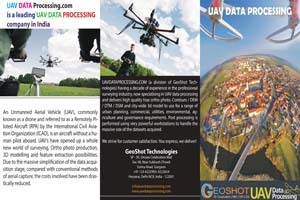 GeoShot Technologies having experience in the professional surveying industry, now specializing in UAV data processing and delivers high quality true ortho photo, Contours / DEM / DTM / DSM and city-wide 3d model to use for a range of urban planning, commercial, utilities, environmental, agriculture and governance requirements. Post processing is performed using very powerful workstations to handle the massive size of the datasets acquired. 1. Ortho Rectification:Using UAV photos and flight log, we do ortho rectification following process which includes aligning photos using each image control point, ground control points and point cloud. Point cloud is processed using UAV images. 2. Data modeling – DEM / DTM / DSM:Aerial Triangulation results generated using UAV images and flight log. 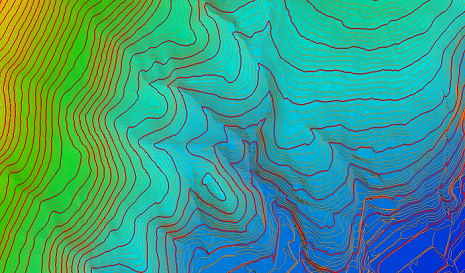 Using Aerial Triangulation results and photogrammetric technique, we generate DEM/DTM and DSM. 3. 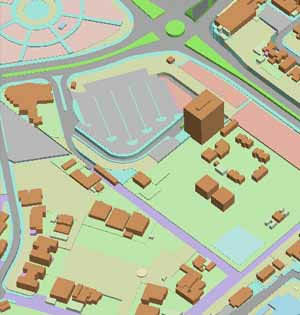 2D/3D Feature Extraction:Using ortho photo, we can capture all planimetric features like road, railway track, building, water bodies, etc.. We can provide output data in any GIS or CAD file format.Using Aerial Triangulation result and photogrammetric technique, we capture all planimetric features. We can provide accurate digital 3D planimetric feature extraction in various formats. 4. 3D Video Production:We have great capability in producing city wide 3D videos using UAV data. Each building in the 3D UAV data model will be further fine-tuned and textured looking at available street photos. then camera will be set and render process will be run for creating video as per the client specification. Our videos will be of high quality real representation of the city.